Since 1921, Romika shoes have been combining fashion and comfort into their premium footwear. Using the most advanced technology and the strictest standards of quality control, Romika has stayed true to its authentic German heritage. Only the best textiles and finest leathers are used in the production of Romika sandals, Romika clogs, and Romika shoes. Join the many that have discovered the benefits of the signature lateral support wings and orthotic-friendly footbeds. Romika remains committed to producing comfortable, durable shoes that reflect the spirit of the times in both style and color. Feel the benefits of thoughtful design and appreciate old world craftsmanship each time you wear a pair of Romika shoes. I really really really wanted to keep these boots but ended up returning them. They are a bit narrow, which works for me, but my heel kept slipping up and moving around in the boot. I do have very narrow heels/ankles so this is a reoccurring issue I have with all my shoes unfortunately. The boots were super cute and fashionable, such a bummer I had to return them. This is my second pair of the Romika brand. Comfort is important to me. I had foot surgery several years ago and my left foot still swells. I also usually need two slightly different sizes after surgery. These shoes are comfortable and stylish. I wore them through the airport with no problem. Having plantar fasciitis makes shoe shopping a challenge. That being the case, you find a brand that works, and stay with it. One of those brands is Romika, and they always come through, for me. I have looked for an attractive navy cancel for some time and decided to go with this. Love the sandal and feel it's worth the price. Thanks, Zappos, for a great experience!!! 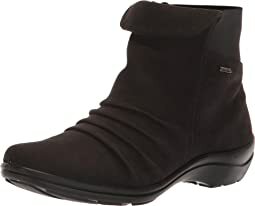 I love Romika, usually just sandals, but ventured into these boots when the weather changed. Can walk a long time in these and feel very stable and supported in these boots. I just got my Romika Cordoba 01 "ocean" colored shoes today, but (sadly) I had to return them because they were too long in the toe. I normally wear a size US8 comfortably, so I ordered the EU39, but I'm exchanging them for EU38. I hope they'll fit. These shoes are beautiful! I love how they fit snugly through the heel, and they feel great in the width, too. I have narrow feet with a high arch, and they fit well, without being sloppy. The leather is soft and flexible. The color is more of a dark grayish blue and less "navy" than I had hoped, and the laces and rubber sole are cream-colored, rather than white, but I still like them. I'll try to remember to update my review after I receive the smaller size. Looks very sharp and classy . . .wish it was slightly higher heel, but it is what the description said. Wore them out yesterday, the day I got them and am sure I will be wearing them alot.. Can't wear high heels anymore because of broken ankle, so these are perfect and who doesn't wear a lot of black?!!! 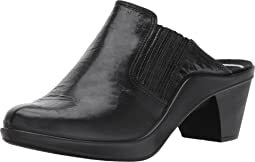 These mules are a nice style and a good balance between the platform height and heel height. I'm returning them because they are a bit narrow in the toe box, and pinch my third and fourth toes. They are a bit too wide at the arch area, which allows the foot to slide forward too, and exacerbates the toe pinch problem. I bought these, in 2 different colors, to replace an old pair. They’re the most comfortable and stylish slip-ons I’ve found. Love them! I wear a 9.5 and bought a 41 in this shoe. It's comfortable and super cute. Not to high, but high enough to give me relief for my Morton's neuroma. Would love other colors that aren't metallic - I had the metallic platinum and sent it back because it was too shiny for me. Replaced it with the solid black. Feels great and looks great. I love these sandals. I have hard feet to fit, usually 8 or 8 1/2wide, the 8 fit perfectly (extra bonus it hides my bunion) was comfortable right out of the box. Thanks! These are great slides. Look great with jeans and denim capris. Note that although I wear a 39 in Dansko sandals, I need a 40 in Romika sandals. 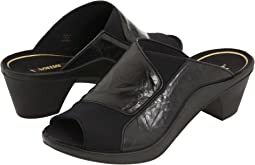 I did end up returning them, but only because I decided I wanted a very similar Romika sandal with an ankle strap instead. I love these so much that I bought them in three colors. Very comfortable for walking. Look great with jeans. Note that although I wear a 39 in Dansko sandals, I need a 40 in these. I ordered a 7.5 and they fit really well. However where the strap start on the inside of my foot really hurt. I think it's the structure of my foot so might not be an issue for others. I really wish they worked for me because they're really cute and comfortable and exactly what I was looking for. I'll be returning them. Perfect sandal for summer. I first purchased these in the beige color which is not accurately depicted here. They were great and I loved but I wanted to try the black because I wasn’t crazy about the white tread on the beige pair. The black has a black tread and that detail made them a winner for me. They are super cute and super comfortable. The leather is very soft. I am typically a 9 in full shoes but I like a toe to heel fit (no space) in a sandal and the 38 was perfect. I find romika’s the best shoe for instertional achilles pain relief. More supportive than tennis shoes. Silver is quite sparkly. Shoes are comfortable as long as not an extended period tim Shoes are confortable for the first hour of walking. I do not reccommend if most of the day is spent walking. These are gorgeous in the black/Kombi color! I was disappointed to return them, but even with adjustable straps, these are not narrow enough for my feet. I was hoping for the best, and have worn other styles of Romika sandals. I wear a 6.5 or 37 in most styles, but a 37 in this sandal felt too long. I think they would have been comfortable if I could have kept my feet in them. Be aware that although it didn't feel slick on hardwood floors, the outsole on these is hard.....not rubbery. I bought this same shoebox last year in pewter in 8.5 WW, my usual size. This year I bought the navy a half size smaller and it fits better. I have bunions, so I love the adjustable width, the neutral colored footbed and the fact that not too much of my toes show. 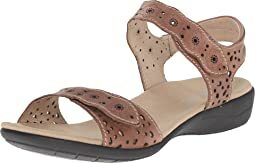 These are super comfortable and look very stylish for a comfort sandal. Although I really liked the way they looked in the pictures, I did not like them in reality when I put them on. They also ranwide on my feet. Back they go. I normally wear a 9.5/10 B. I bought this is a 41 and it fits well - plenty of room without being too roomy. 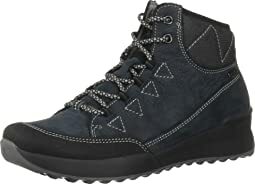 I have some foot issues and so appreciate Zappos patience with my numerous orders and returns - I would have kept this because it fits well and is comfortable except for the cutouts in the leather, which cut into and left stencil like impressions on my feet. Sad to return them - kept the Romikaromika Mokassetta 244, which was more comfortable. Love the look of this shoe with pants and jeans. Very comfortable. Usually wear 8.5 wide. Ordered a 40, but had to return for a 39. Definitely runs large.